The Ranger School's Family Weekend had an international flare this year as foresters from Germany were on hand to learn about forest management in the Adirondack Park and share information about the Bavarian national parks. Foresters from Bavaria, in Germany's southern region, came to the school in Wanakena to develop a better understanding of the different forest management techniques in the United States and Germany. "They'll be making comparisons with their counterpart system in Europe, and developing professional contacts during their visit," said Dr. Michael Bridgen, director of The Ranger School. 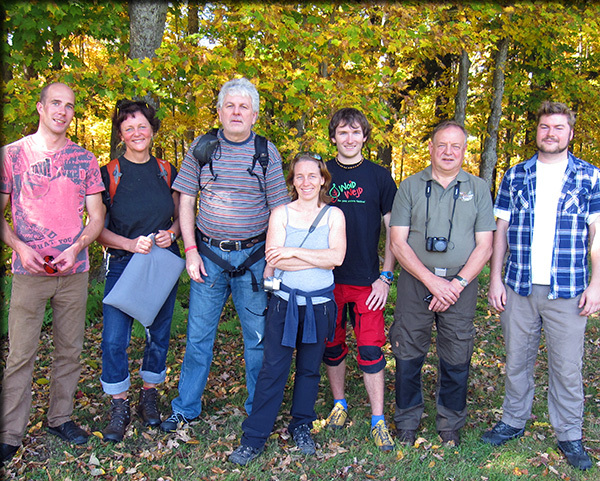 The trip was organized by Arthur Reinelt, head of geoinformation for the Bavarian Forest National Park. Reinelt has led previous groups to The Ranger School. The Germans' arrival coincided with the Ranger School's Family Weekend, providing a unique opportunity for everyone. "The foresters will make presentations to the students and students' families, describing forestry and park management in Germany," Bridgen said. "This will provide an 'international' experience for our students without having to go international." The foresters' visit also provides a valuable professional resource for New York Department of Environmental Conservation forest rangers, Adirondack Park Agency officials and local recreation industry staff who interact with them during their visit, according to Bridgen. The visit not only includes events at The Ranger School, but also visits to the Adirondack Museum and Lake Placid, hikes, and presentations to local officials and interested parties. "The activities were selected to demonstrate silviculture and forest/park management activities, as well as recreational and cultural activities within the park," Bridgen said.